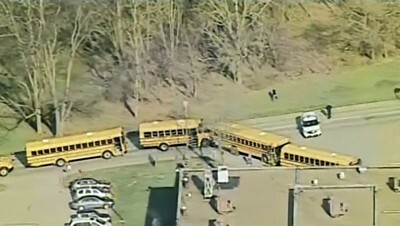 School buses are parked outside Franklin Regional High School after reports of stabbing injuries in Murrysville, Pennsylvania on April 9, 2014. 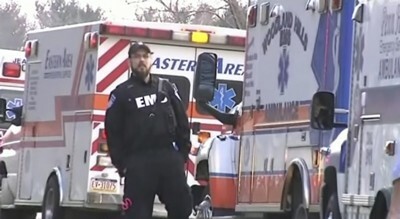 MURRYSVILLE, Pennsylvania - A 16-year-old student wielding two knives went on a stabbing rampage in the hallways of a Pittsburgh-area high school on Wednesday, wounding 22 people before he was tackled by an assistant principal, officials said. 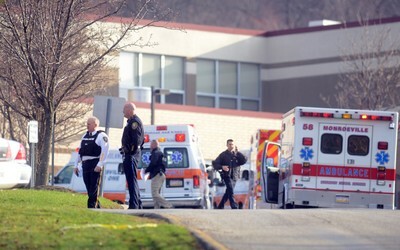 The attacker moved furtively through Franklin Regional High School halls, stabbing his victims in the torso and slashing their arms and faces, students and officials said. 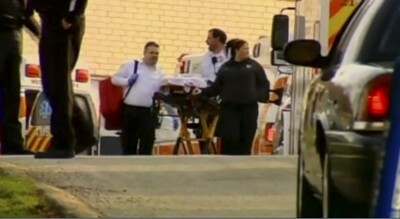 Some of the injured taken to nearby hospitals were in critical condition, doctors said. Students described a scene of panic, with the school hastily evacuated after a fire alarm was pulled. The unidentified sophomore suspected in the attack was in police custody, said Tom Seefeld, chief of police in Murrysville, Pennsylvania. 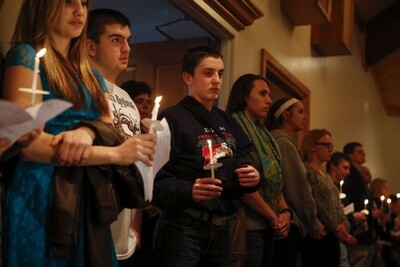 "He did it so stealthily that at first no one knew what was happening," said freshman Josh Frank. "We heard a girl scream bloody murder. Then two seniors were running down the hall and we followed them out of the school." The attacker, described by a classmate as a quiet person who kept to himself, started his rampage at around 7:13 a.m. (11:13 GMT), walking along the hallways to several classrooms at the school in Murrysville, 20 miles (32 km) east of Pittsburgh, officials said. Assistant Principal Sam King tackled the boy, who was armed with two "straight knives" of about 8 to 10 inches (20-25 cm), and an armed security officer handcuffed him with help from King, Seefeld said. Westmoreland County District Attorney John Peck told a news conference that the teen would likely be charged as an adult, possibly with aggravated assault and attempted murder, and then his name would then be released. Two other students suffered nonstabbing injuries - "things like scraped knees and twisted ankles," trying to get out of the school, Stevens added. 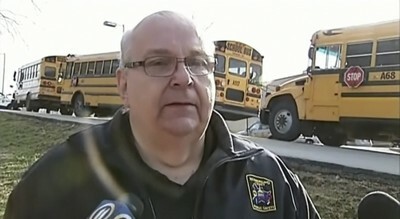 He added the teenage suspect was not counted among the wounded. Among those praised for heroics during the incident was Nate Scimio, the student who pulled the fire alarm and helped shield classmates, witnesses said. "There's not enough words to describe how much of a hero he is," classmate Trinity McCool posted on Facebook. 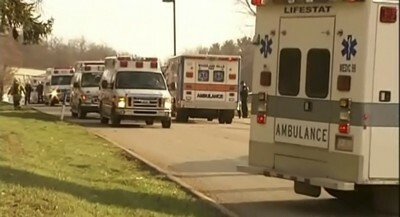 The victims, most of them 14 to 17 years old, were transported to area hospitals, four by medical helicopters. Several had life-threatening injuries, hospital officials said. 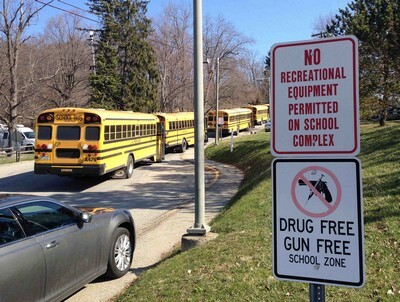 School buses are parked outside Franklin Regional High School after reports of stabbing injuries in Murrysville, Pennsylvania April 9, 2014. 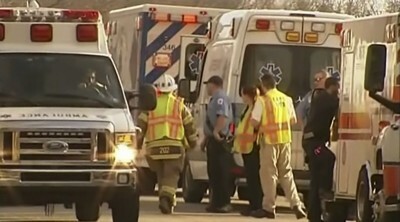 Twenty students were injured after a stabbing attack, apparently by a male student, at a Pennsylvania high school on Wednesday, and four of the victims were flown to area hospitals, officials said. 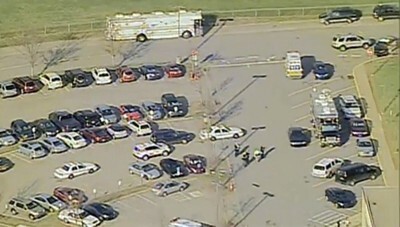 Emergency vehicles are seen in a parking lot outside Franklin Regional High School after reports of stabbing injuries in Murrysville. 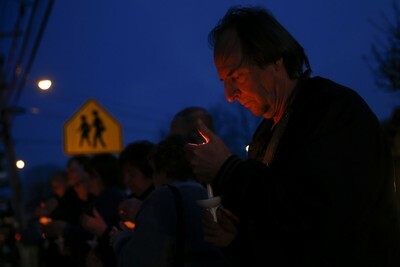 People wait outside of Franklin Regional High School after reports of stabbing injuries in Murrysville. 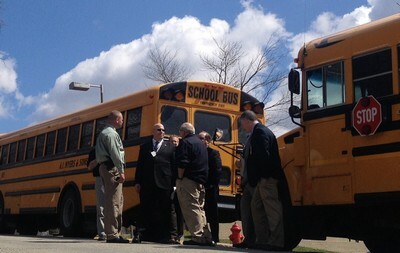 Emergency personnel gather outside of Franklin Regional High School after reports of stabbing injuries in Murrysville. The 16-year-old student was wielding two knives as he went on a stabbing rampage in the hallways, wounding 22 people before he was tackled by an assistant principal, officials said. 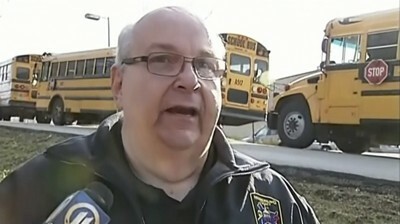 Stevens, deputy emergency management coordinator for Westmoreland County, speaks to the media outside of Franklin Regional High School after reports of stabbing injuries in Murrysville. 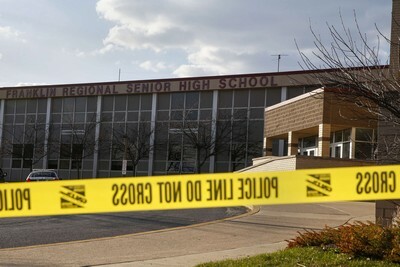 The attacker had moved furtively through Franklin Regional High School halls, stabbing his victims in the torso and slashing their arms and faces, students and officials said. 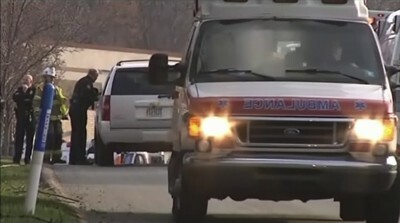 Some of the injured taken to nearby hospitals were in critical condition, doctors said. 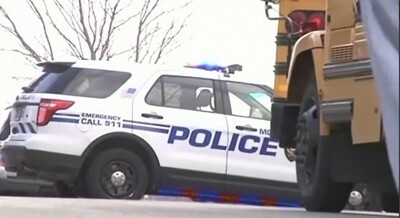 A police vehicle is seen outside Franklin Regional High School after reports of stabbing injuries in Murrysville. 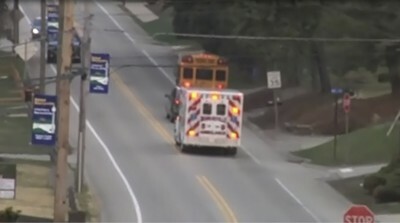 An ambulance is seen outside Franklin Regional High School after reports of stabbing injuries in Murrysville. A young man speaks to a policeman outside of Franklin Regional High School after reports of stabbing injuries in Murrysville. 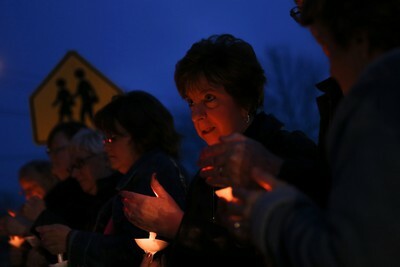 People are seen outside of Franklin Regional Heritage Elementary School after reports of stabbing injuries in Murrysville. A young man runs outside of Franklin Regional High School after reports of stabbing injuries in Murrysville. People leave Franklin Regional High School after reports of stabbing injuries in Murrysville. Stevens, Deputy Emergency Management Coordinator For Westmoreland County speaks with Piraino, superintendent of Franklin Regional School District in Murrysville. 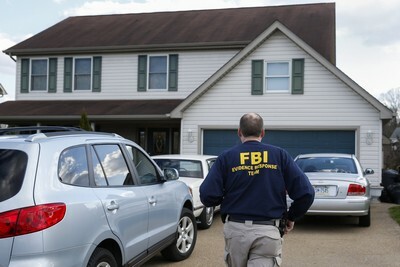 An FBI agent enters the family home of a suspect after a series of knife attacks at at Franklin Regional High School in Murrysville, Pennsylvania. 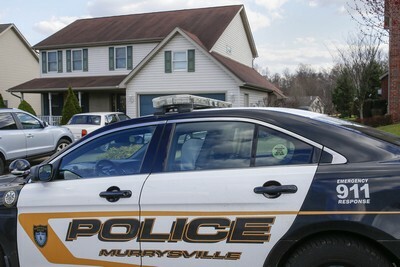 A Murrysville Police vehicle is seen at the family home of a suspect after a series of knife attacks at at Franklin Regional High School in Murrysville, Pennsylvania. 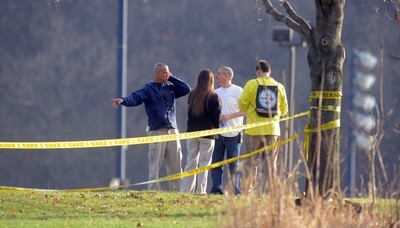 Police tape is seen outside Franklin Regional High School after a series of knife attacks in Murrysville. 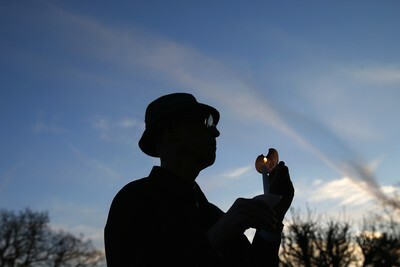 A man holds a candle during a prayer vigil for victims of the Franklin Regional High School stabbing rampage, at Calvary Lutheran Church in Murrysville. 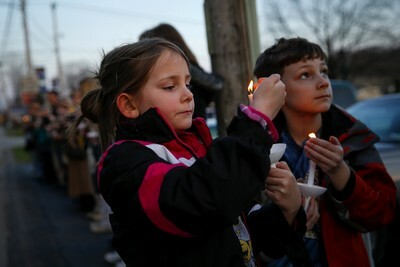 Children hold candles during a prayer vigil for victims of the Franklin Regional High School stabbing rampage, at Calvary Lutheran Church in Murrysville. 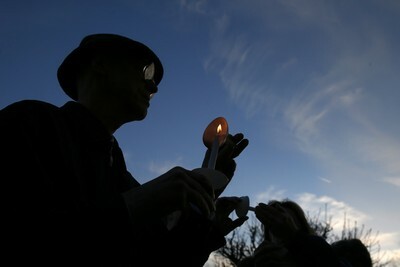 People hold candles during a prayer vigil for victims of the Franklin Regional High School stabbing rampage, at a church in Murrysville. 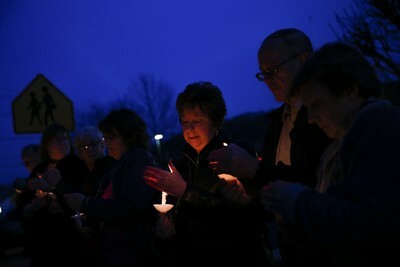 As students were reunited with parents near the hilltop high school in the relatively affluent Pittsburgh suburb with a population of about 20,000, teens spoke about the incident. Pennsylvania Governor Tom Corbett said he had ordered state police to help local law enforcement respond to the incident. The FBI also said it had deployed agents to work with local law enforcement. 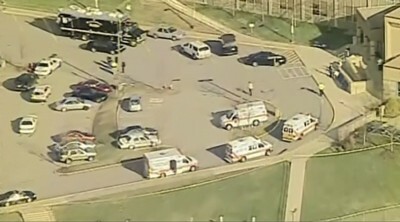 The high school will be closed for the next two to three days while police conduct an investigation, officials said.